I never cease to be amazed that you can walk into any barn or field anywhere and find a Wisdom Horse waiting to bestow healing, knowledge, or inspiration to you, if only you ask. While filming our Valentine to Horse video at a new boarding barn, it happened again, this time, with a gorgeous white Arab mare named Rabi. 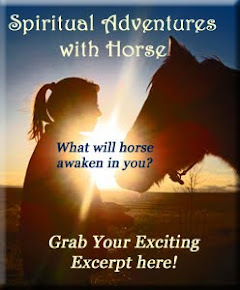 After catching Rabi’s shot on video with my companion, Dela Whitaker, contributor to the e-book Spiritual Adventures with Horse, we were standing in her pen, talking about all of Rabi’s gifts of wisdom. Indeed, we were emanating gratitude for Who She Really Is and what She has Come Here to Offer. It was a spontaneous gift we were presenting to her, a horse who, like so many others, is rarely seen or appreciated for Who She Really Is. As this bubble of yumminess enveloped us all, Rabi seemed intent on having a “moment” with me. With clear purpose, she moved into my heart space, standing directly in front me, her nose on my heart. Then with her eyes half mast and her breathing deep and rhythmical, Rabi dropped into The Zone, a sure invitation to join her in sacred, soul to soul communication – a subtle yet powerful level of interaction where all things are possible. 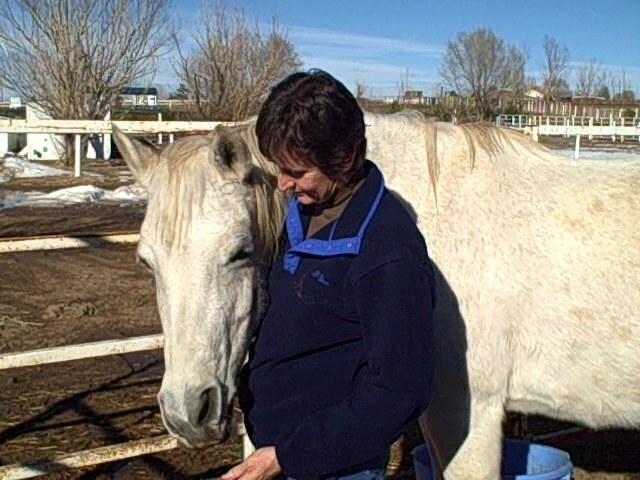 When these outward signs are present, if you can still your mind and open your heart, you’ll be treated with an inner gift: hearing the whisperings of the Divine flow through you and your equine companion. As I stood in that sacred stillness with Rabi, feeling the sugar sweet flow of loving connection, my heart did open and Rabi’s spirited words filled my awareness with a gorgeous vision. “Imagine a world where every Being is seen for Who They Really Are. Where the unique gifts that they have come to contribute to the world are deeply acknowledged and appreciated,” Rabi suggested. Rabi sent her vision with such heart-felt emotion that I immediately could sense what that kind of world would feel like to inhabit and it brought tears to my eyes. “I can see that!,” I replied, agreeing with her that we humans still had a ways to go to re-member this heart-based way of being. In that instant, her spark of inspiration made my own mission more clear and it heightened my resolve to continue joining with Horse to spread the Truth. I felt even more gratitude spill out of my heart toward Rabi for the gift she had just given, and I sensed her lean into the beauty of being appreciated for Who She Really Is. “I’d like to walk with you on this path,” Rabi offered, helping me to know that she is available in any moment that I wish to connect, heart to heart, no matter our distance from each other. “I accept your offer,” I replied as I gently kissed her nose, grateful to feel, once more, that we are never alone on our journey, that beings of all shapes and sizes are ready to support us, when we still our mind and open our hearts. That’s the essence of the Equi-Heart Pledge! To honor ourselves and our Horse friends for who we really are, co-creating a new world of gratitude, oneness, and heart wisdom. So join with Horse to remember the Truth of Who You Are and What You Came Here to Offer. 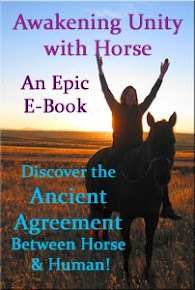 At the same time, as you connect with Horse, you will remember Who Horse Is and grow in gratitude for all of the wondrous gifts they are offering to Humanity at this special time in our evolution. Please join us on Feb 15, 2012 as we embark on the Equi-Heart Pledge- a month-long global spiritual adventure! How will your life change if you connect with the Wisdom of Horse for 30 days! Make that commitment to yourself and I guarantee you’ll never see yourself or Horse the same way again- as you move closer to your true Magnificence! Invitation to Meet Your Own New Wisdom Horse Friend! In the meantime, why not seek out a new Wisdom Horse friend. I invite you to walk into any barn or pasture, and see who you are drawn to. See which horse is looking at you, whose consistent gaze invites you to join with them on a heart to heart level. Then stand quietly with that horse, just appreciating their Being. Enter that stillness and see what message, gift, or inspiration they wish to share with you! Wisdom Horses are all around, when we take the time to see them.